Product #46059 | SKU 77DKIS | 0.0 (no ratings yet) Thanks for your rating! 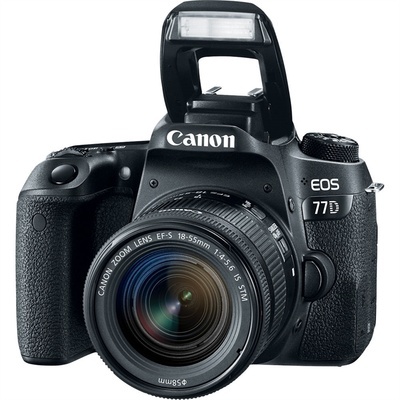 In addition to stills recording, the 77D also supports Full HD 1080p video recording at up to 60 fps in the MP4 format with IPB compression, or 30 fps in the MOV format with ALL-I compression when making in-camera time-lapse movies. Video recording is benefitted by the inclusion of Dual Pixel CMOS AF and the Movie Servo AF focusing functions, as well as the touchscreen design of the LCD monitor for intuitive control. Movie Electronic IS is also featured to minimise the appearance of camera shake across five axes for smoother, steadier recording when shooting handheld. Additionally, an external microphone jack is incorporated in the body design for greater control over your recorded sound. Unique to most video recording systems, the 77D also features an HDR Movie mode that can be used to achieve greater highlight and shadow detail when recording in high contrast scenarios. This mode captures two HD frames at different exposures, one normal and one underexposed, in short succession at up to 60 fps and then composites them during playback at 30 fps to create a movie with a longer-appearing dynamic range. Included with the camera body is the EF-S 18-55mm f/4-5.6 IS STM lens, which provides a 28.8-88mm equivalent focal length range that covers a variety of perspectives from wide-angle to portrait-length. Its design integrates an STM focusing mechanism that provides near-silent focusing abilities with smooth and precise control. Additionally, the Optical Image Stabiliser system helps to minimise the appearance of camera shake by up to four shutter speed steps in order to benefit working in low-light conditions and with greater zoom magnifications. Picture Style modes: Auto, Standard, Portrait, Landscape, Fine Detail, Neutral, Faithful, Monochrome, and User-Defined settings.Creative Filters: Grainy B&W, Soft Focus, Fisheye Effect, Water Painting Effect, Toy Camera Effect, Miniature Effect, and HDR Art (Standard, Vivid, Bold, Embossed).